Before the details of the invention are made public (publicly disclosed); even if it only contains part of the whole invention. Inventors should consider the possibility of protecting an idea when they are ready to make public presentations or publish an idea in order to retain the best intellectual property rights possible. 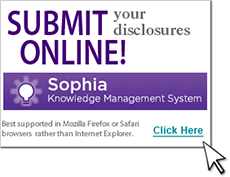 Common public disclosures include published abstracts, published manuscripts and other publications, poster presentation or displays, seminar and conference presentations and discussions, Internet publications of funded grants, articles in local or national press, etc. Conception of the invention does not need to include completed experiments and data supporting it, but it should include your best effort at explaining the experiments that would be done to show it works. The best course of action is to talk with STC as soon as possible to discuss what options are available to protect the idea prior to public disclosure. Details and instructions for disclosing an invention are described in the “Commercialization Process” section. STC staff are glad to help and to discuss the disclosure process; it is never too early to call the appropriate party at STC.UNM to discuss if it is the right time to disclose.